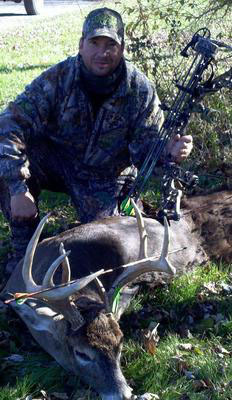 It was a cold Western New York November morning just 2 days before the start of shotgun season 2012. A half hour into legal light a big bodied "fork" horn buck walked within 15 yards behind my tree stand. As I watched him "mark" his spot, I knew he wasn't the big boy on the block trashing the woods around me with the size of the fresh scrapes and rubs that seemed to multiply each passing day and I was very content on letting him pass. An hour after he walked out of sight, my suspicion proved correct when a huge body, thick rack 9-point showed up at the creeks edge, 90 yards in front of me. As he bent to drink, I grunted him, to which he immediately lifted his head looking to see who dare challenge him in his domain. After a second grunt, and a well timed North wind to carry the 4 points scent to his nostrils, he crossed the creek and came towards me on a rope. I was quickly pressed into action to find the spot that my G5 broad headed arrow needed to fly. He closed into 40 yards within seconds when I drew the string of my Matthews Z7 Extreme into the ready position. At 30 yards I let out a loud "blat" that failed not only to stop his fast paced gait, but even to slow his pace, his complete focus on the area from which the scent was released. I set the fury to which my bow contained loose when he reached 25 yards and my arrow penetrated and blew through his side with pinpoint accuracy. 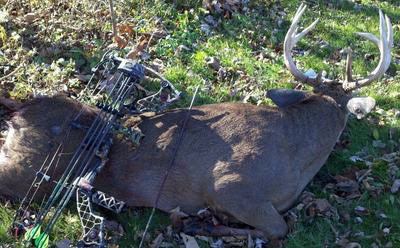 The shot proved lethal as this 144 inch, 202 pound field dressed 9-point ran 5 yards, stopped and looked behind him before walking his final 15 yards and dropping face first into the "marked" spot. This was just further proof if you can hold off from dropping those "small" racked buck and let them mature, that with the right equipment, practice and patience, you will have plenty "trophy" buck to be proud to mount.